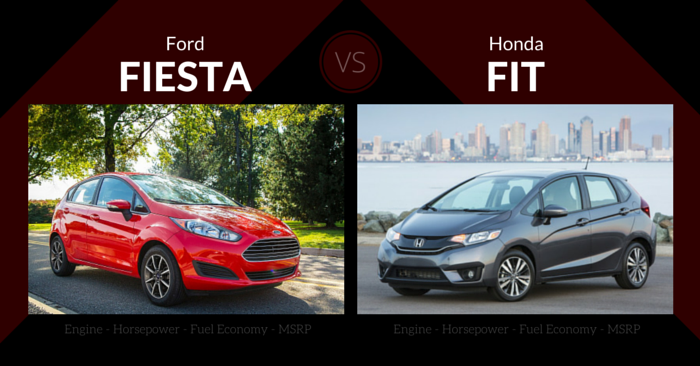 Compact cars are incredibly popular thanks to great fuel economy and low price point. The Mazda MAZDA3 has long been a front-runner in the class. The Dodge Dart nameplate, which was resurrected in 2013, is trying to make a name for itself in this competitive market. Can the Dart overpower the veteran MAZDA3 for best compact car? 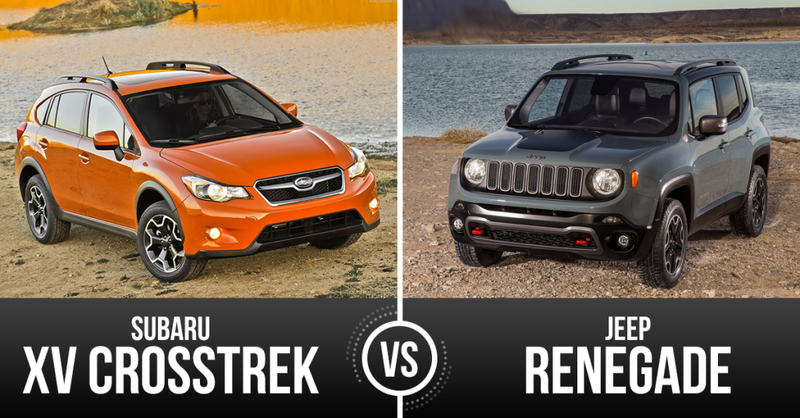 Find out in today’s Monday Vehicle Matchup. Somewhere in between the design of the Dodge Charger and Dodge Neon you’ll find the 2015 Dodge Dart. This sedan has a fresh, sporty exterior style you won’t find in much of the competition. The Dodge Dart features a Charger-like tail lamp stretched across the entire trunk. The grille is a low-set, slim version of the grille found on most other Dodge vehicles in the 2015 model year. For an entry level sedan, the Dart has high-quality interior materials. With buttons and gauges logically placed and a presentation that is easy on the eyes, there shouldn’t be many complaints considering the price point. Although the interior is quite roomy, the front seats don’t seem to adjust low enough for some tall adults, and frontal seat cushions can be uncomfortable during longer trips. However, the interior seating feels like that of a mid-size car, rather than a compact car. Storage space is competitive for the class. 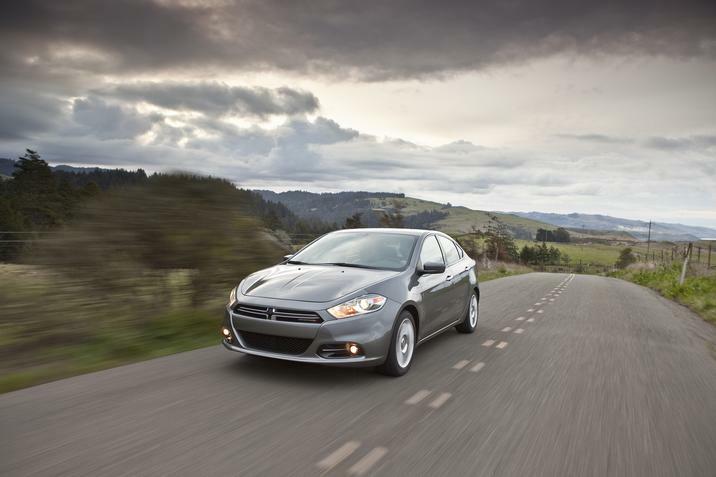 The base 2.0L 4-cylinder engine can fall short carrying the 3,300 lb Dodge Dart. Much of the competition will produce better performance in the base trim. The optional 1.4L turbocharged engine will produce more power than the base, and will be adequate for most drivers. The top of the line 2.4L 4-cylinder engine produces 184 hp, and it is the most powerful of the 3 engine options for those craving high speed and acceleration. In general, the 2015 Dodge Dart falls behind in terms of fuel economy. The base automatic engine achieves 24 city mpg and 34 highway mpg. The most efficient trim is the Dodge Dart Aero, which replaces some steel parts with forged aluminum, and adds some aerodynamic aids. The Aero can achieve up to 28 city mpg and 41 highway mpg. With 5-stars from the NHTSA, and a “Top Safety Pick” from the IIHS, this sedan excels in safety. This car comes with 10 standard airbags, and a suite of optional safety features such as blind spot monitoring and rear cross path detection. The entry level Dart only has the basics, and even foregoes air conditioning. 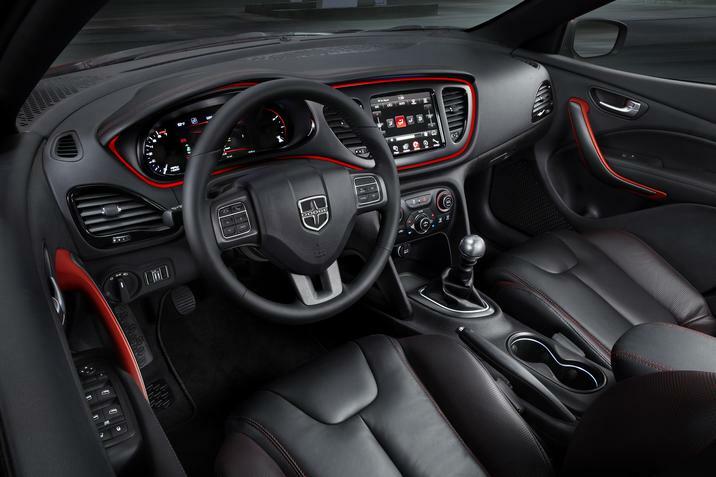 Dodge claims there are more than 100,000 build combinations, with options like keyless entry, sunroof, leather seats, 8.4-inch infotainment screen, U-connect infotainment, premium audio, pushbutton start, navigation, active grille shutters, chrome grille, and much more. The 2015 Mazda MAZDA3 was redesigned in 2014 with sharp lines, a modern look, and a pentagon variation of Mazda’s old smiley-face grilles. Available as both a sedan and a hatchback, the MAZDA3 is an aggressive design with crisp edges that feel sports-car derived. The hood is quite long, and can seem somewhat out of place. The cockpit design of the MAZDA3 is driver focused, with any of the buttons and gauges arranged directly in front of the driver. Buttons and gauges are simple, without feeling cheap or plain. Materials are quite high quality, a pleasant surprise for the relatively low price point. 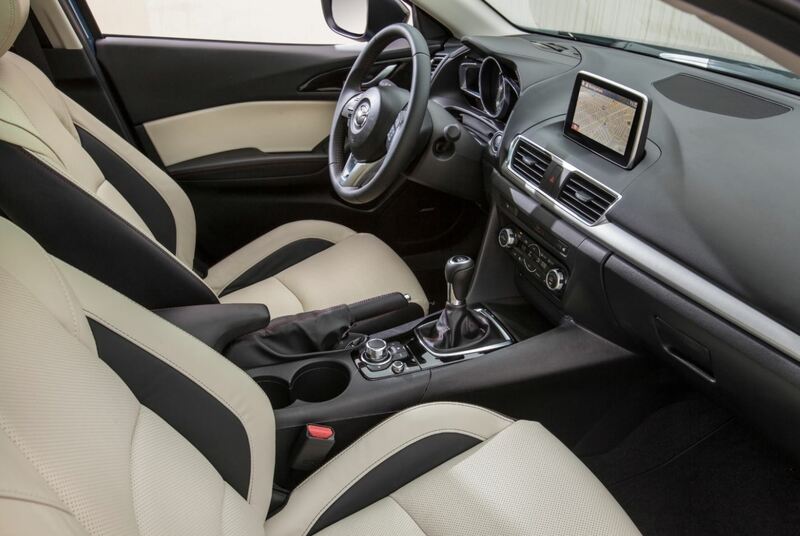 Seating in the 2015 Mazda MAZDA3, particularly in the front, is top of the class. There is plenty of room for 4 full-sized adults, but head room may be an issue for tall passengers in the back seat. Cargo space is much larger in the hatchback than in the sedan, but this vehicle has average cargo space for the class. 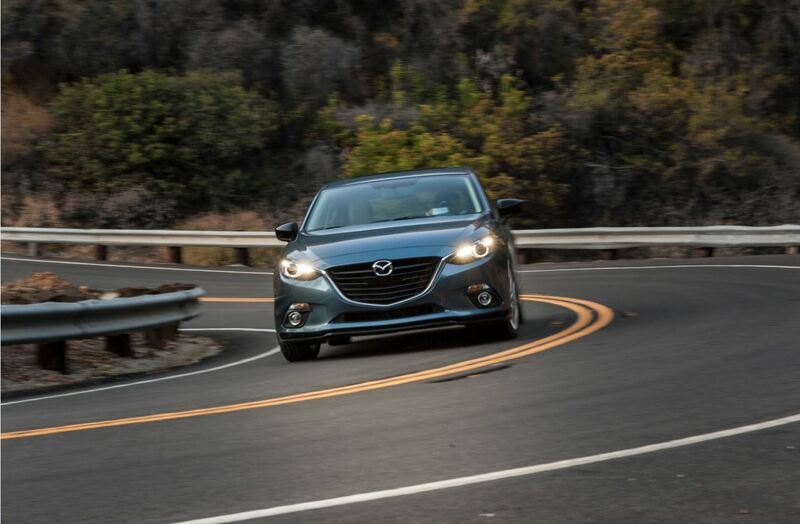 While many compact cars are known for lackluster performance, the MAZDA3 delivers. The 2.0L engine is very fast and responsive. The upgraded 2.5L engine isn’t much different, but is noticeably faster in the lower end of the rev range. Steering, handling, and overall drivability are impressive for the class. The base MAZDA3 achieves 29 city mpg and 41 highway mpg. Hatchbacks achieve slightly lower fuel economy than their sedan counterparts, and the 2.5L engine also achieves slightly lower fuel economy. In the class these are good numbers, especially considering the premium performance. With a “Top Safety Pick+” rating from the IIHS, the MAZDA3 is one of the safest small cars available. Optional safety features include lane departure warning, adaptive front lighting, rear cross traffic alert, bling spot monitoring, rearview camera, forward obstruction warning, automatic braking, and more. Every model includes keyless entry, push button start, rear-seat air ducts, along with all the expected amenities in a 2015 sedan. The optional feature list is quite extensive, including Mazda Connect infotainment, navigation, leather upholstery, LED running lights, paddle shifters, active grille shutters, power moon roof, upgraded audio, front heated seats, rain-sensing wipers, and much more. The base Dodge Dart, although affordable, foregoes air conditioning and many other expected features. The base MAZDA 3 comes with many great features you don’t normally see at the bottom tier. 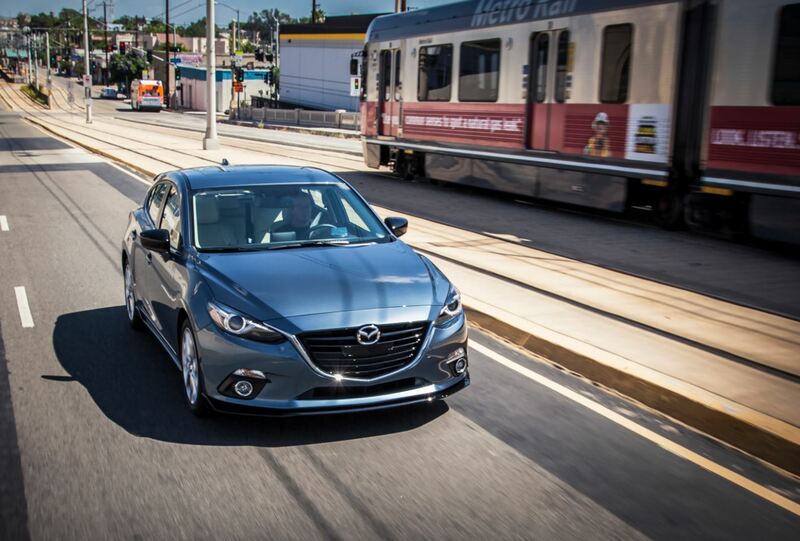 Add that to great driving performance, and the MAZDA 3 is the clear winner. The top of the line Grand Touring MAZDA3 comes in at around $30,000, but is an incredible value with all the amenities of a luxury sedan. From top-notch safety features to incredible performance, the MAZDA3 is the complete package. 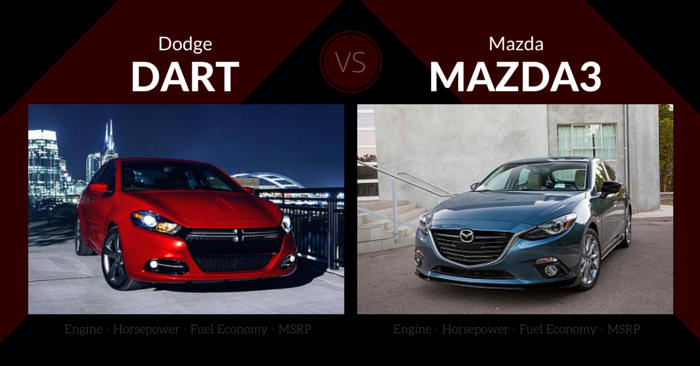 When comparing the 2015 Dodge Dart vs Mazda MAZDA3, the MAZDA3 is the clear winner. The young, hip Dart is both tech-savvy and sporty, but it still lacks refinement of longer-running models. The 2015 Mazda MAZDA3 has been front-runner in the compact car class for a long time, and this shows no sign of changing. Would you rather have a Dodge Dart or Mazda MAZDA3 in your garage? Let us know in the comments below!